The toys' plastic wires can detach from the hubs, due to insufficient adhesive. This allows the beads to slide off. The loose beads pose a choking hazard to young children. 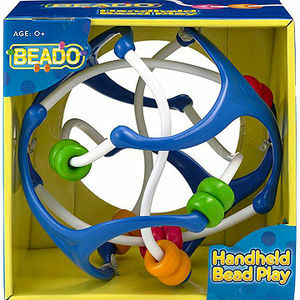 This recall involves about 5,500 Beado handheld beaded play toys with model number 1501 and date code 02910 04323A. The product measures six inches in diameter and is composed of four blue plastic hubs, six white plastic wires, and twelve multi-colored beads that slide along the wires. The model number and date code are printed on the bottom of the packaging, and the date code is also imprinted inside of the blue hubs. The following Beados are not included in this recall: those that have a date code different than 02910 and those that have a date code of 02910, an inspection sticker on the bottom of the packaging, and a black mark by the date code inside the blue hub. Specialty toy and juvenile retailers from March 2010 through May 2010, for about $12.